CS2N uses a combination of Robot Virtual Worlds, world class training materials, and badges to motive students to learn how to program as it provides assessment opportunities for students, parents, and teachers. We know that kids like robots and that sometimes they begin to learn how to program at school or at an after-school activity. Many students would love to continue to learn at home but they don’t have access to a robot at home. 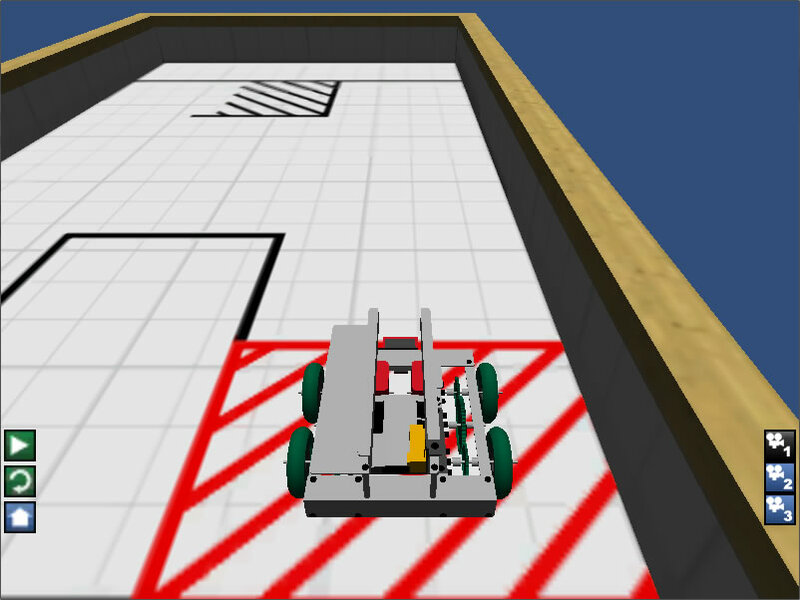 Robot Virtual Worlds allow kids to earn badges as they learn programming. RVW enables kids to develop code at home and load that code onto their robots at school. Curriculum Companion – The ROBOTC RVW Curriculum Companion is free for 60 days (plenty of time for students to learn to program) and aligns with the free training videos found at www.robotc.net. 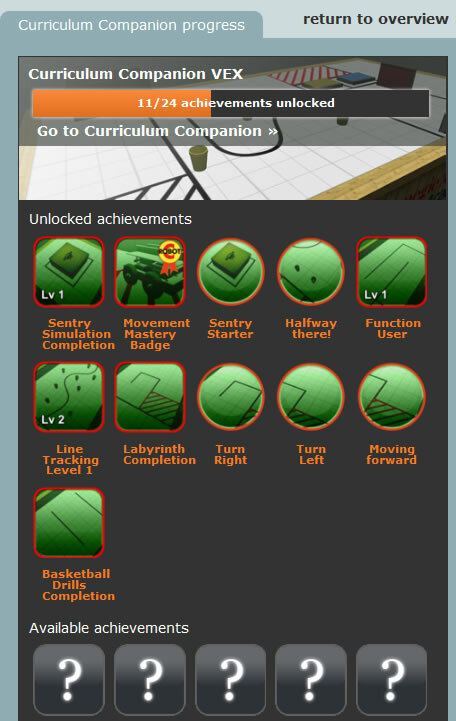 Pictured at the upper left is a screen shot of a student’s CS2N personal homepage that shows some of the badges that they’ve earned. The round badges are progress badges, the rectangular badges designate that the student has completed one of the challenges, and the badges with the yellow ribbon indicate mastery of that level; this student has mastered the programs in the “Movement” section. The RVW challenges provide programming practice challenges for students and prepare them to take the ROBOTC Certification test. Pictured at the center is the Curriculum Companion interface. Note that there are 13 challenges to solve in the movement section. The challenges with the stars next to them are required challenges for students to earn the mastery level badge. 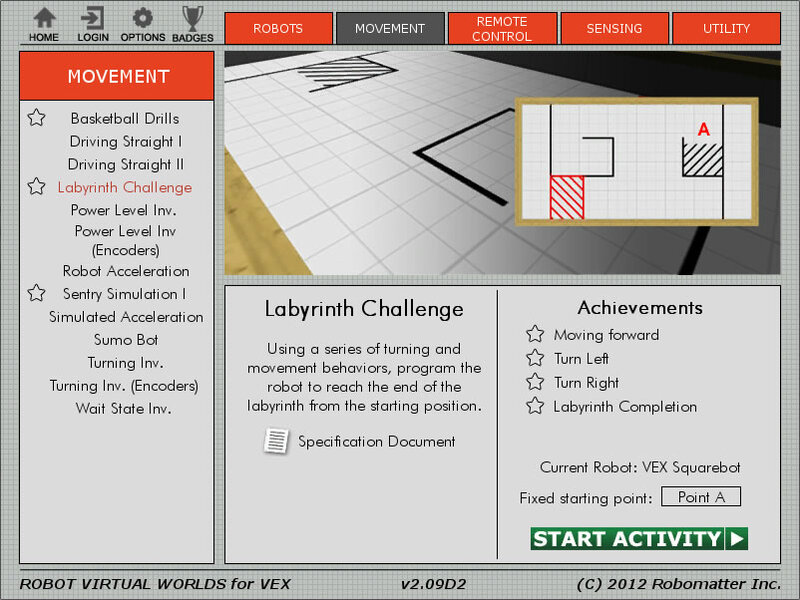 Pictured below is the Labyrinth challenge using a virtual VEX robot. For schools and clubs that don’t have enough robots students can develop their code virtually and then load it onto their robot. Badges to Certification Course – CS2N offers a ROBOTC Certification course through CS2NLearn which uses a combination of badges earned through the RVW challenges and quizzes to assess students and ensure that they are ready to take the ROBOTC certification test. Students can earn a bronze level certification if they take the class independently. For the Gold Level Certification the course needs to be offered by a Certified Teacher. Free Curriculum Support Materials The ROBOTC Curriculum for TETRIX and LEGO Mindstorms and VEX Cortex Video Trainer using ROBOTC are two educational resources that are freely available at www.robotc.net. Both products are designed to take a student who has no prior robotics or programming knowledge, and allow them to use motors, sensors, remote control, and understand programming topics like functions and variables. Students are asked to follow along with tutorial videos, and then practice what they’ve learned in a programming challenge. RVW has various badge types designed to allow everyone to see a student’s progress. If a student has a CS2N account and has logged into CS2N, their badges will appear on their CS2N page. Students also have the opportunity to create an "offline" account within the software, which will keep track of their progress on that computer. Picture above: The Curriculum Companion has three types of badges (identified by stars in the software): Motivation, Progress, and Mastery. Students receive a Motivation Badge for partial completion of a challenge, a Progress Badge for completion of the challenge, and a Mastery Badge when they successfully complete several challenges in each unit, proving their knowledge.